Kristin Hjellegjerde Gallery is proudly presenting the second solo exhibition of Chris Agnew following his successful inaugural show in 2014. Landscapes and scenery come in and out of view, obscured by a dense fog of engraved, parallel lines. Jungle vistas and broken columns emit a heavenly aura of blue, or pinkish-orange light. They shine. They glow in the half-light. Elsewhere, a sullen harbour is engulfed in a Strombolian explosion of warfare, an eruption of orange and yellow lines that crash down like an asteroid shower. Perfect, stiff images from the annals of history are both obfuscated and brought to life by primal lines – zigzags, sparks, trees and flowers become doodles on the face of historical record, marked by the artist’s own hand. Dither (8th of January - 6th of February 2016) is Chris Agnew’s second solo exhibition at Kristin Hjellegjerde Gallery, following on from his successful inaugural show in 2014. Agnew’s oeuvre deals with the construction and deconstruction of belief systems. The malleable nature of truth – as seen in political, religious, social and cultural circumstances – intrigues him. “The gap between what we know to be true and what we believe isn’t always one and the same,” he has said. “Facts have a habit of falling into the gaps that beliefs have opened.” This sense of historicity, and its malleability, is echoed in Agnew’s choice to use historical etchings and classical paintings as his point of reference. He employs a painstaking etching process that sees him engrave directly onto the gesso surface of primed wooden panels. He then applies black oil paint, which he later wipes off to reveal the etching, and finally paints with precision onto areas of the surface. Agnew uses this ‘permanent’ technique, alongside painterly interventions, to show us just how impermanent – on its surface – information and truth can be. However, where previous works played with volume, seeing entire figures or areas obscured, blotted out or filled with tessellated patterns, Agnew’s interruptions in Dither have taken on a more linear, and altogether more physical, aspect. Through his etching process, Agnew removes all evidence of the artist’s hand – and then, at the very final stages of creation, he reintroduces the artist’s presence in the guise of permanent, semi-violent markings. In fact, one could argue, they are made after the initial ‘completion’ of the work, in an act of artistic self-vandalism, for Agnew takes a work that appears perfect and polished in its detail, only to score it with inerasable lines. While each panel is still laboriously prepared by the artist himself, and the engraving done by him as well, he now works in horizontal lines with the help of a ruler system, seeking to create a machine-like precision that allows the final effect to resemble a mechanically-produced print. Agnew has also removed definable narratives from the pieces. 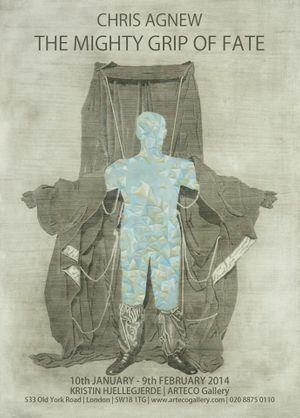 Where the works he showed in 2014’s The Mighty Grip of Fate presented figures and stories, these new etchings put noticeable protagonists on the backburner, instead allowing Agnew’s final deft scribbles to rise to the forefront.